Those who believe there is a system of checks and balances in the “U.S. government” don’t understand War and Emergency Powers (keep in mind that Congress sees “war” and “emergency” as virtually the same). Every president since FDR and some before him have declared some kind of “emergency” or “war,” i.e. economic, health, environmental, terrorist, etc. in order for legislative powers to be vested in the executive, usually in the form of executive orders that circumvent due process in order to oppress. Like previous presidents, Trump has invoked the National Emergencies Act (50 U.S.C. 1601 et seq.) (NEA) and the International Emergency Economic Powers Act (50 U.S.C. 1701 et seq.) (IEEPA), declaring “National Emergencies” to implement Executive Orders. He is again preparing to declare a “National Emergency” under the guise of an immigration emergency to get up his border wall (or is it a fence?) “and other matters”. Hopefully the information below will increase understanding of what the declaration of a “National Emergency” really means to the people living on America. 2 Corinthians 8:13-14 - I do not urge you to give in order that others may have relief while you are unduly pressed, but that, by equalization of burdens, your superfluity having in the present emergency supplied their deficiency, their superfluity may in turn be a supply for your deficiency later on, so that there may be equalization of burdens. What is implied in the right to govern? 6. It implies obligation, on the part both of the ruler and the ruled, to be always ready, and when occasion arises, actually to make any personal and private sacrifice demanded by the higher public good—to cheerfully meet any emergency, and exercise any degree of self-denial, that can, and will, result in a good of greater value to the public than that sacrificed by the individual, or by any number of individuals, it always being understood, that present voluntary sacrifices shall have an ultimate reward. 7. It implies the right and duty to employ any degree of force, which is indispensable to the maintenance of order, the execution of wholesome laws, the suppression of insurrections, the punishment of rebels and disorganizers, and sustaining the supremacy of moral law. It is impossible that the right to govern should not imply this; and to deny this right, is to deny the right to govern. Should an emergency occur, in which a ruler had no right to use the indispensable means of securing order, and the supremacy of law, the moment this emergency occurred, his right to govern would, and must, cease: for it is impossible that it should be his right to govern, unless it be at the same time, and for the same reason, his duty to govern; and it is absurd to say, that it is his right and duty to govern, and yet at the same time, that he has not a right to use the indispensable means of government. If it be asked, whether an emergency like the one under consideration is possible, and if so what might justly be regarded as such an emergency, I answer, that should circumstances occur under which the sacrifice necessary to sustain, would overbalance the good to be derived from the prevalence of government, this would create the emergency under consideration, in which the right to govern would cease. 2. A sudden or unexpected happening; an unforeseen occurrence or condition; specifically, a perplexing contingency or complication of circumstances. 3. A sudden or unexpected occasion for action; exigency; pressing necessity. 4t. Something not calculated upon; an unexpected gain; a casual profit. A sudden unexpected happening; an unforeseen occurrence or condition; specifically, perplexing contingency or complication of circumstances; a sudden or unexpected occasion for action; exigency; pressing necessity. A relatively permanent condition of insufficiency of service or of facilities resulting in social disturbance or distress. Kardasinksi v. Koford, 88 N.H. 444, 190 A. 702, 703, 111 A.L.R. 1017; Contract Cartage Co. v. Morris, D.C.I11., 59 F.2d 437, 446; Los Angeles Dredging Co. v. City of Long Beach, 210 Cal. 348, 291 P. 839, 843, 71 A.L.R. 161. "Emergency" in sense of constitutional provision respecting referendum does not mean expediency, convenience, or best interest. State v. Hinkle, 161 Wash. 652, 297 P. 1071, 1072. "state of war". Brown v. Bernstein, D.C.Pa., 49 F.Supp. 728, 732. Confrontation by sudden peril. 38 Am Jist Negl § 41. A pressing necessity: an exigency: an event or occasional combination of circumstances calling for immediate action or remedy. An unforeseen occurrence or condition calling for immediate action to avert eminent danger to life, health. or property. 43 Am J1st Pub Wks § 136. Any event which threatens peril to the nation or the people. An event of which cognizance must be taken if the safety of the nation and its people is to be preserved. A sudden unexpected happening; an unforeseen occurrence or condition; perplexing contingency or complication of circumstances; a sudden or unexpected occasion for action; exigency; pressing necessity. Emergency is an unforeseen combination of circumstances that calls for immediate action. State v. Perry, 29 Ohio App.2d 33, 278 N.E.2d 50, 53. See also Emergency doctrine; Sudden emergency doctrine. Under the doctrine variously referred to as the "emergency," "imminent peril," or "sudden peril" doctrine, when one is confronted with a sudden peril requiring instinctive action, he is not, in determining his course of action, held to the exercise of the same degree of care as when he has time for reflection, and in the event that a driver of a motor vehicle suddenly meets with an emergency which naturally would overpower the judgment of a reasonably prudent and careful driver, so that momentarily he is thereby rendered incapable of deliberate and intelligent action, and as a result injures a third person, he is not negligent, provided he has used due care to avoid meeting such an emergency and, after it arises, he exercises such care as a reasonably prudent and capable driver would use under the unusual circumstances. Sandberg v. Spoelstra, 46 Wash.2d 776, 285 P.2d 564, 568. In an emergency situation when medical service is required for an adult who by virtue of his physical condition is incapable of giving consent, or with respect to a child, whose parent or other guardian is absent, and thus incapable of giving consent, the law implies the consent required to administer emergency medical services. This is a good defense to an action of tort for an alleged battery. A state of national crisis; a situation demanding immediate and extraordinary national or federal action. Congress has made little or no distinction between a "state of national emergency" and a "state of war". Brown v. Bernstein, D.C.Pa., 49 F.Supp. 728, 732. When a person finds himself confronted with a sudden emergency, which was not brought about by his own negligence or want of care, such person has the legal right to do what appears to him at the time he should do, so long as he acts in a reasonably prudent manner as any other person would have done under like or similar circumstances, to avoid any injury, and if he does so act, he will not be deemed to have been negligent even though it might afterwards be apparent that some other course of action would have been safer. Swann v. Huttig Sash & Door Co., C.A.Tex., 436 F.2d 60, 62. Under sudden emergency doctrine, one placed in position of sudden emergency or peril other than by his own negligence, is not held to same degree of care and prudence as one who has time for thought and reflection. Dadds v. Pennsylvania R. Co., Del., 251 A.2d 559, 560. 1. A legal principle exempting a person from the ordinary standard of reasonable care if that person acted instinctively to meet a sudden and urgent need for aid. A state of national crisis or a situation requiring immediate and extraordinary national action. A condition declared by the President or the Congress by virtue of powers previously vested in them that authorize certain emergency actions to be undertaken in the national interest. See also mobilization. An unforeseen combination of circumstances, or the resulting state, that calls for immediate action. Emergencies may include a fire, explosion, discovery of an explosive device, severe weather, chemical or biological exposure or threat, hostage situation, or physical threat to building occupants or visitors, terrorist attack, or other national security emergency. Any incident, whether natural or manmade, that requires responsive action to protect life or property. Under the Robert T. Stafford Disaster Relief and Emergency Assistance Act, an emergency means any occasion or instance for which, in the determination of the President, Federal assistance is needed to supplement State and local efforts and capabilities to save lives and to protect property and public health and safety, or to lessen or avert the threat of a catastrophe in any part of the United States. a general declaration of emergency with respect to the national defense made by the President or by the Congress. functioning of securities markets, investment companies, or any other significant portion or segment of the securities markets; or (ii) the transmission or processing of securities transactions. (B) the President has declared a major disaster under the Robert T. Stafford Disaster Relief and Emergency Assistance Act. an urgent situation in which there is clear evidence that (a) an event or series of events has occurred that causes human suffering; and (b) for which a government concerned has not chosen, or has not the means, to remedy; or (c) is created by a demonstrably abnormal event or series of events that produces dislocation in the lives of residents of a country or region of a country on an exceptional scale. McClelland v. Interstate Transit Lines, 142 Neb. 439, 6 N.W.2d 384, 391. But rule cannot be invoked by one bringing emergency on or not using due care, to avoid it. Brown vs. Bernstein, D.C. pa., 49 F. Supp. 728, 732. Congress has made little or no distinction between a 'state of national emergency' and a 'state of war'. The American Print Works vs. Laurens, 1 Zabriskie, 248. There are cases undoubtedly in which the right to destroy property may exist without any remedy by the owner against the public or individuals. Thus it has been held that the right to destroy property in cases of extreme emergency, as to prevent the spread of a conflagration, is not the exercise of the right of eminent domain, nor the taking of it for public use, but is a right existing at common law, founded on the plea of necessity, and may be exercised by individuals. Block v. Hirsh, 256 U.S. 138, 41 S.Ct. 138. …our Supreme Court held, in spite of the constitutional prohibitions, that public emergency ‘may justify a law which could not be upheld as a permanent change. Chastleton Corp. v. Sinclair, 264 U.S. 543, 44 S.Ct. 405, 68 L.Ed. 841. "A law depending upon the existence of an emergency or other certain state of facts to uphold it may cease to operate if the emergency ceases or facts change even though valid when passed." Jones v. Seward (1863), 40 Barb.(N.Y.) 563, 570. "If the fathers of the Constitution intended that a dictatorship should exist under any emergency, they would not leave it to the chief executive to assume it when he may, in his discretion, declare necessity required it. That the President can of his own accord assume dictatorial power, under any pretext, is an extravagant presumption." Under the powers delegated by these statutes, the President may: seize property; organize and control the means of production; seize commodities; assign military forces abroad; institute martial law; seize and control all transportation and communication; regulate the operation of private enterprise; restrict travel; and, in a plethora of particular ways, control the lives of all American citizens. A majority of the people of the United States have lived all of their lives under emergency rule. For 40 years, freedoms and governmental procedures guaranteed by the Constitution have, in varying degrees, been abridged by laws brought into force by states of national emergency. Because Congress and the public are unaware of the extent of emergency powers, there has never been any notable congressional or public objection made to this state of affairs. Nor have the courts imposed significant limitations. But emergency powers laws are of such significance to civil liberties, to the operation of domestic and foreign commerce, and the general functioning of the U.S. Government, that, in microcosm, they reflect dominant trends in the political, economic, and judicial life in the United States. 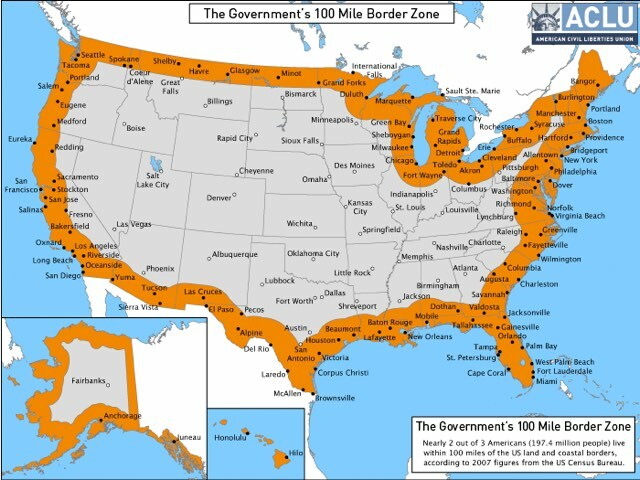 I'll post about the term "border" in the future, but for now here is a map showing the extent of the "border" that may be occupied by the military industrial complex, keeping in mind that in Sec. 2 jurisdiction was also given "over border lands"